Washington Law Center’s attorneys have been dedicated to serving the people of Washington. The experienced attorneys of Washington Law Center are ready to help you. Our team of personal injury attorneys will assist you or a loved one that has been injured in an accident or when using a product. Washington Law Center’s labor and industries attorneys can also help you with your financial problems and give you assistance when the state is delaying your social security or workers’ compensation claim. We stand behind our work. Washington Law Center has a “No Fee Promise.” If we do not win your case, you don’t owe us a dime. Legal issues require immediate attention. If you need help, don’t delay in contacting our Seattle attorneys or Tacoma attorneys. The sooner you contact us the better chance we have of gaining a positive outcome for you. If you have a situation that differs from the ones listed here, we have a referral network that can address your case immediately. Call Washington Law Center today and so we can fight for you! We’re located in both Seattle and Tacoma. We understand incidents can happen at all hours of the day. If you find you need assistance after hours, call our 24/7 consultation line. 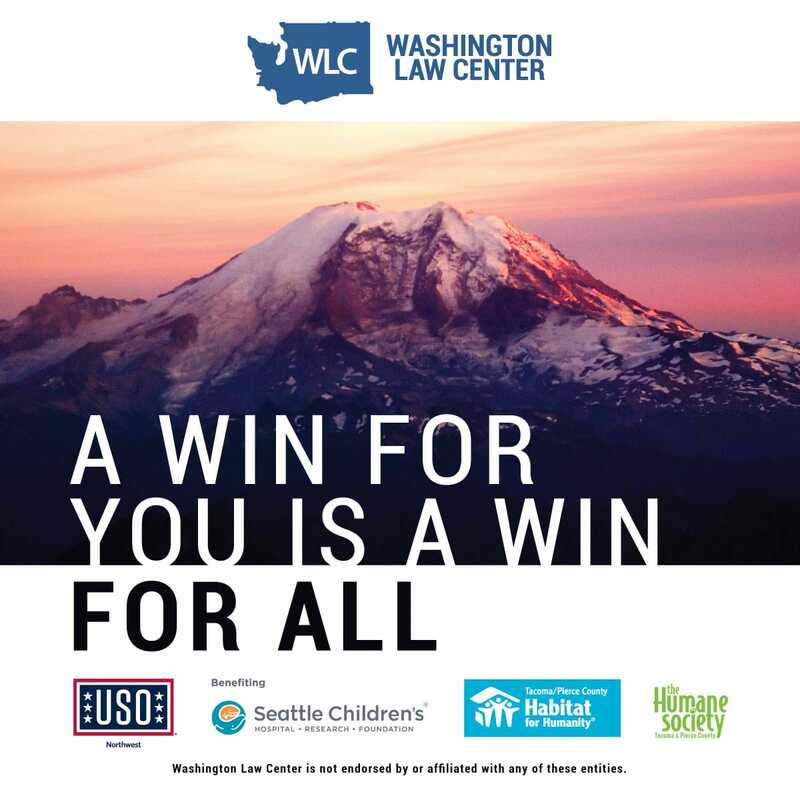 At Washington Law Center we appreciate the opportunity to be a part of this great community. We work hard to achieve the positive results that our clients deserve and feel fortunate to have the success we have had serving the greater Seattle-Tacoma area. In an effort to give back to our community we have instituted the We Give Campaign. Upon the successful conclusion of a case, we donate money from our fees to a deserving charity. We let the client determine where the money goes by choosing from one of the following charities: Seattle Children’s Hospital, Humane Society for Tacoma & Pierce County, Tacoma/Pierce County Habitat for Humanity & USO World Northwest. It is our goal to inspire others in the business community to do the same. We are grateful to live and work here. This is just one way that we want to show it. The need exists, and not just in the greater Seattle/Tacoma area. The We Give Campaign is an effort to make our community and our world a better place for everyone. IF YOU’RE LOOKING FOR A DEDICATED TEAM OF ATTORNEYS, YOU’VE FOUND THE RIGHT TEAM. WLC is not a legal clinic, charitable organization or affiliated with any government entity.